No, I am not gross. No, my hair is not greasy. No, I am not a hippy. I haven’t used shampoo, conditioner, or hair products on my hair in a long tim. My hair has never felt so amazing. It’s soft and shiny. It is healthy. I have been doing what people call the “no poo” method. No I don’t put poo on my head…I’m not a Rastafarian!!! Haaaaa! “No Poo” stands for “no shampoo”. Get it?!! Ok, it actually took me awhile to get it. I would hear other natural-minded friends talk to me about the “no poo” method and I just didn’t get it. Then I started looking for a more natural way to color my hair. I discovered Henna! 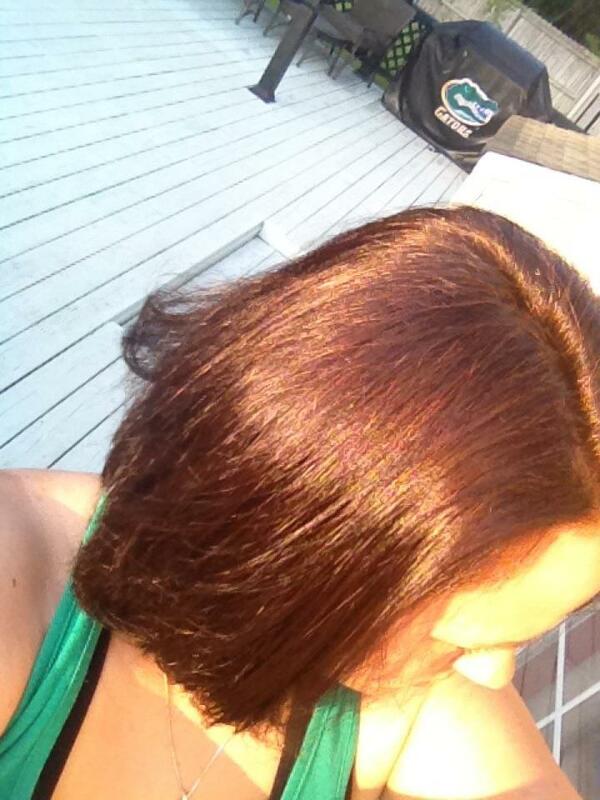 You can read about my Henna journey here: https://thepaleomama.com/2012/04/01/henna-hair-dye/ . I LOVE Henna now. I have done it every 6-8 weeks for awhile now. I will never go back to chemical-laden dyes. Henna is amazing. Ok, back to “no poo”! “No Poo” Method is used when you make a baking soda paste as the shampoo/cleaning part and an apple cider vinegar rinse for the conditioner part. Ask your mamas how they used to get their hair to shine. They will say vinegar! This is nothing new; nothing hippy. I love bringing back what our mamas and grandmas used to do. They had it right in so many ways. Our modern-day culture is far from where we need to be. When it comes to living sustainably, I am all for it. So, when I finally started to understand the “no poo” method I figured I would give it a good try and LOVE it! There are many methods that people use. I have found this method to work best for me: add 2 tablespoons of baking soda to about 1-2 cups of water. Pour this all over your wet head. Use your fingertips and really scrub your roots and scalp. This is where the grease starts and where I really focus on. I really don’t bother with the rest of the hair much when I am using the baking soda rinse. I make sure that all my roots and scalp are scrubbed and then I rinse it out. Now, we have been brainwashed to believe that scrubbing bubbles and foam equals clean. Not true! And you won’t get that with this method…or many other natural methods of cleaning. Chemicals are used to create foam and I’m not for that. Once you rinse out all the baking soda then you are ready for the conditioner. I take 2 tablespoons of apple cider vinegar and add it to a cup of cold water. Because I don’t really like the smell of vinegar and I don’t like the smell in my hair, I add 5-8 drops of Sweet Orange essential oil to the mixture. This smell is heavenly! Next, I pour this all over my hair and massage it in really good, especially into my ends. I leave it on for a few minutes while I finish up the rest of my shower and then rinse it out with cold water. The colder the water, the more shiny and soft your hair will come out. 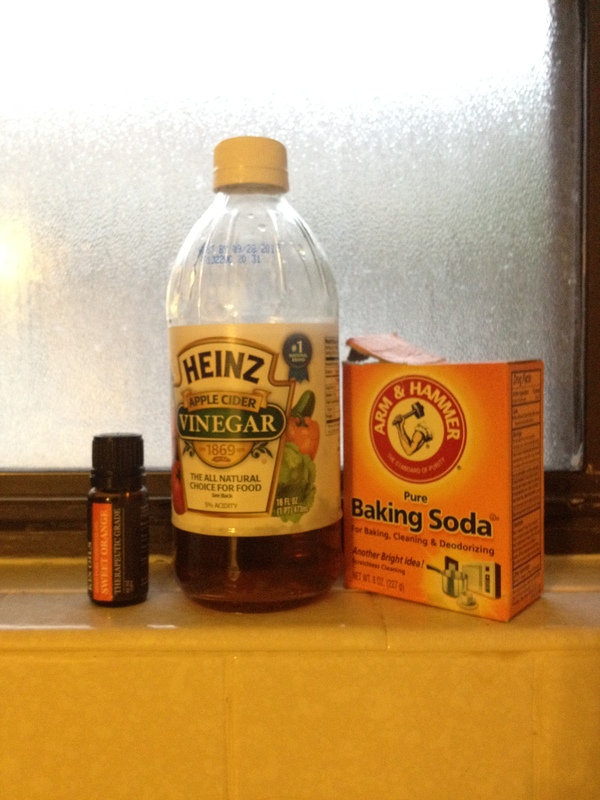 The vinegar rinse also balances your PH levels after the baking soda wash.
My hair used to be so coarse. In order for it to look good, I had to blow dry it and then straighten it. My hair was so damaged by the overuse of chemicals in all the hair products I was using and the overuse of heat in styling it. Now, my hair is so soft I don’t even have to use any kind of styling products to make it soft, like serums. I don’t blow dry it anymore. I let it air dry and then sometimes I will straighten it. If it starts to feel a little coarse throughout the day, I rub a teeny tiny amount of coconut oil on it and it softens it right up. I love my hair now! Using this method has also helped the Henna coloring to stay on longer and doesn’t fade. The only time I have to re-do my coloring is when my white roots start to grow out. Hope this encourages you to give it a try! Also, your hair goes through a period in the beginning when it overproduced sebum (hair grease) because it’s so used to be washed everyday with shampoo that strips the natural oils off. Don’t fret! This period only lasts a few weeks at the very most. Wash your hair 2-3 times a week and it will eventually even out. wow that’s very interesting! might actually try this, hope it works for my dry hair *fingers crossed*. Rub a teeny tiny bit of coconut through your hair when it’s dry. It softens hair very well! Doesnt your hair smell like dirty hair when you sweat? haha…no it doesn’t. It smells like hair and if I sweat a lot then, of course, I wash it. Hi Jackie, where do you get your orange oil? I get my essential oils off Amazon. I make sure they are therapeutic grade. Thank You Jackie, i am gonna try this and so is a friend! We are tired of commercial shampoo’s and conditioner’s, even the Organic ones! Same here! It’s nice to not have a dependency on them anymore and to feel 100% confident that there are no nasty chemicals going in your family’s hair! What does theraputic grade mean? Is that the same as pure essential oil? I’m not sure it is the same as pure essential oil. It should say if it is therapeutic grade. It is the best kind you can get and won’t be watered down. Just ordered from Amazon, Thanks! Love this! Thanks so much for the idea. Should I do this every night or is that bad for my hair? No you don’t need to every night. Try to just wash twice to three times a week. That way your hair can restore its natural oils! Actually yes, I hear its great for curly hair. Mine is wavy and it makes my hair so soft. I hear those with thin, fine hair have more trouble with it. So…. I do have very fine hair. Does that mean I may not wanna go this route? I’m still gonna try to find alternate products that are all natural then. Naturally I have black straight soft hair, but because of blond highlights that I got my hair started getting rough and it would tangle in the back of my head. So I would apply extra conditioner on that spot, but that was good only for a day, after that my hair would get dry and tangle again and I had to apply oil and brush it thoroughly to get rid of the knots and sometimes I would cut them. As soon as I switched to BS and ACV I was very satisfied with the results. My hair was clean and smelled good. But only after a month I saw how my body adopted itself and started healing naturally by conditioning itself just enough to get rid of the dryness and the knots. I just realized this yesterday and I was so amazed by the result that I wanted to share it on the web! I have severely dry scalp. Do you think this would help? It may help because there are no harmful chemicals. You could give it a try! Let me know if I can help! Hi there, I gave this a go after reading your post. Been really pleased with the results. I could wash my hair around 9pm and it would be greasy for 5pm the next day. My hair is only starting to get really greasy on the third day now and it seems in much better condition. My only problem is that my itchy, flaky scalp has really took off! Do you know if this is still just a transitional period (been doing this since start of december) or are there other things I could do alongside BS and ACV to reduce it? Something tells me getting your fingers in there and having a good scratch to get it all out isnt the answer! If I was you, on the days that I wash, I would grab a scoop of coconut oil and really rub it into the scalp. Then I would let it sit in there for a few minutes before you proceed with the baking soda and apple cider vinegar wash. Have you always had a dry scalp? My son was born with cradle cap and still has dry scalp. This is the only thing that works for him. Hope that helps! Adding a drop of tea tree oil or lavender oil with the baking soda wash will help with itching and dry scalp. Jackie, is there a certain brand of apple cider vinegar you use? I use Braggs organic in my water. I just use the generic store brand for my hair. I use Braggs in our food though. Braggs is definitely the best quality! I’m a few weeks into my no-poo journey! Shh…don’t tell anyone. 🙂 I’m going to adjust a bit to your methodology. I’m not letting the ACV soak in-maybe I need to try that. I’m really interested in trying this but have a few questions! Is this something that you can use on the kids too? How often to wash for them? Can you prepare it in advance to make it easier to just hop in the shower? I already only wash every other day, will that make the adjustment any easier (in theory) for my hair (oil glands)? I do a partial no poo on my daughter’s hair. I use Dr. Bronners liquid castile soap for the wash, and I use the Apple cider vinegar rinse for condition. You just have to be careful not to get the vinegar in their eyes. Hi I was wondering where do you get your henna from? I have hair same color as your maybe a little light so im thinking of the indigo and the henna… just curious where I can get them?? thanks!!! I actually get mine from a local Indian store for super cheap! Do you have one near you? yeh I think we do have ill check them out thank you!!!! Just tried this, my hair already feels amazing! Could you use distilled white vinegar instead? Thanks! Hmmm, I’m not sure. I love the apple cider vinegar…I’ve never tried white. I go to a salon every couple months for highlights. You said there is a transitional period when you switch over to this, will I have to transition after each salon visit since they use salon shampoo and conditioner? You can either tell them not to wash it with shampoo and conditioner, just rinse it out. Or you can ask if they have sulfite-free shampoo and conditioner, which is better than the regular stuff. I tried this for the first time & already love the Orange! Is it possible to wash with this every day? I have really thin and greasy hair and the maximum time I don’t need to wash is 2 days. I wouldn’t recommend washing everyday. do you go through your EO quite fast???? Do you make the “no poo” and conditioner up in batches or just take everything into the shower? Your website is a great find! I’m looking to start me paleo adventure in the next few days. If I made small batches of the shampoo/ conditioner/toothpaste how long would they last? Ideally I’d make them on a weekly basis. Does you hair smell like vinegar if you dont use essential oils? No, the smell of vinegar usually dissipates quickly. One question- and maybe a silly one at that- but, is there any specific recipe used to make the paste or the rinse in bulk? ( i dont know if the hubs has the patience to “concoct” a recipe each hair washing day) Whats the most efficient storing method you use in your bathroom for the products? I have scalp psoriasis and wanted to get away from chemicals as much as possible. I have all ready used ACV on my head to help ease the itchyness caused by psoriasis. How many times a week would you use the baking soda and water if you exercise daily and sweat a lot? Also, have you ever made or used natural shampoo bars? If so do you have a favorite recipe?